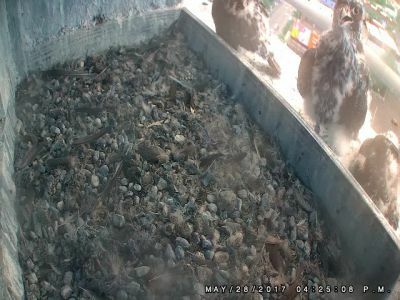 The Kalamazoo Peregrine falcon chicks are now just over a month old. They are getting more independent and spent most of today out on the parapet ledge. Both parents were nearby and kept close watch on these little adventurers. It is quite nerve wracking to see them out of the box when they are not yet ready to fly. They still have a lot of down and their tail feathers are obviously still very short and not full emerged. But, they are flapping their wings and getting some early practice at being birds. Hopefully, they are building up those flight muscles. They will most likely take their first flights within a week or so. It will be crucial for all falcon fans to watch for these youngsters during their first flights. They often end up on the ground since they can coast down and do not have the strength or skill to fly up from the ground. A grounded bird is at risk and needs to be rescued. They will be sent to rehab for a few days to get some flight practice in a protected environment and then will be released to rejoin their family. If you are willing to be on Peregrine Patrol in downtown Kalamazoo, send a message through the website.